Budapest, 6th district Nagymező u.4. 6 clean, spacious, modern rooms in a cheerful pension. All rooms are equipped with air condition, bathroom, cable TV, phone and minibar. In the morning they provide a delicious breakfast. 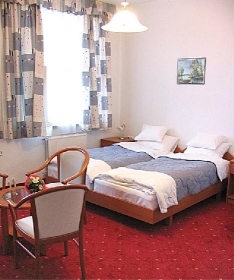 You have a good rest in an enjoyable and tranquil environment in the heart of Budapest for a friendly price!!! Within a few minutes the sights of the city are easily reachable. Subway (M1 - Oktogon), trolley and bus stops are in a very close distance. #1.: by public transport: take the blue public bus (BKV ) from the airport to Kőbánya-Kispest terminus. Here you change for the blue metro line (M3) to "Deák tér" station. At Deák square please change for the old millenarian underground (yellow line, M1) and take it to "Opera" station. Then on foot you can reach the accommodation by walking towards "Oktogon" square. On the right hand side you will find "Nagymező" utca -> turn right, after 200m on your right you will find the mini pension. On our site there's a small map, I hope it will help.